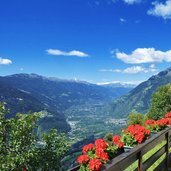 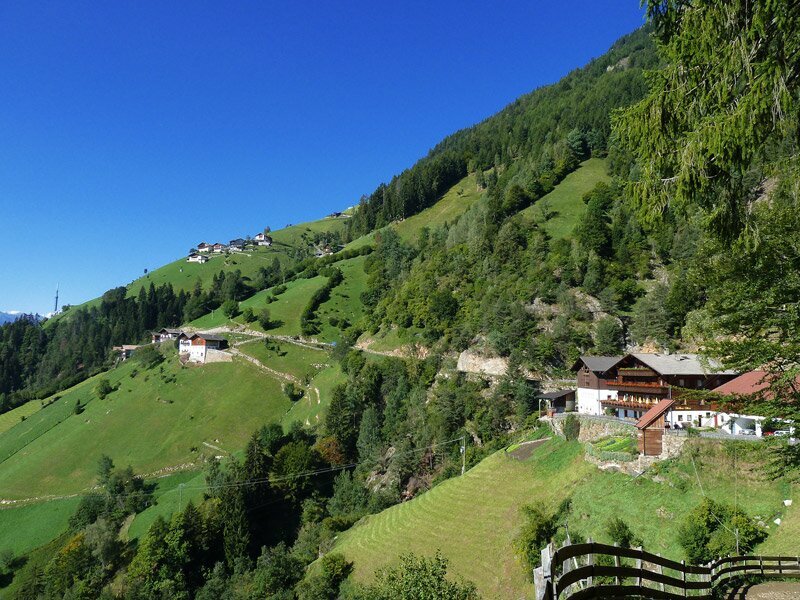 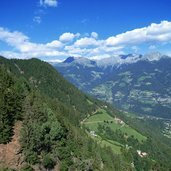 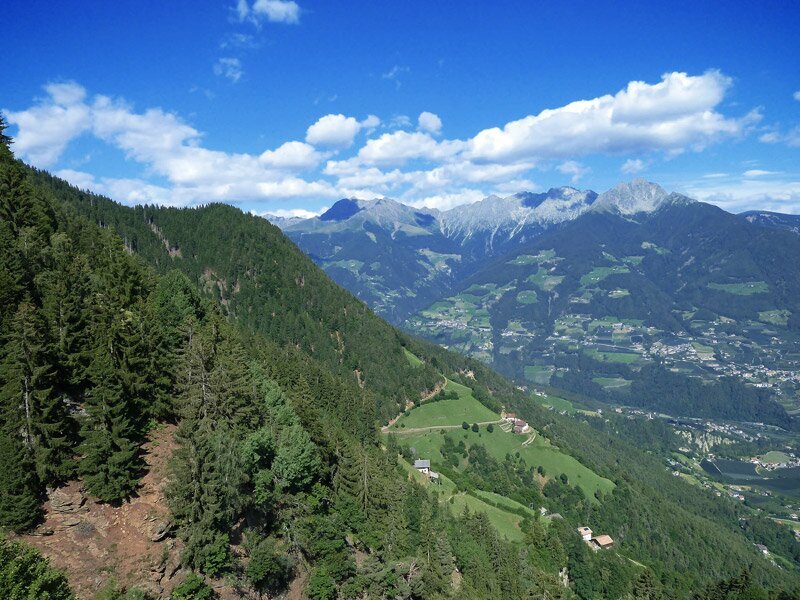 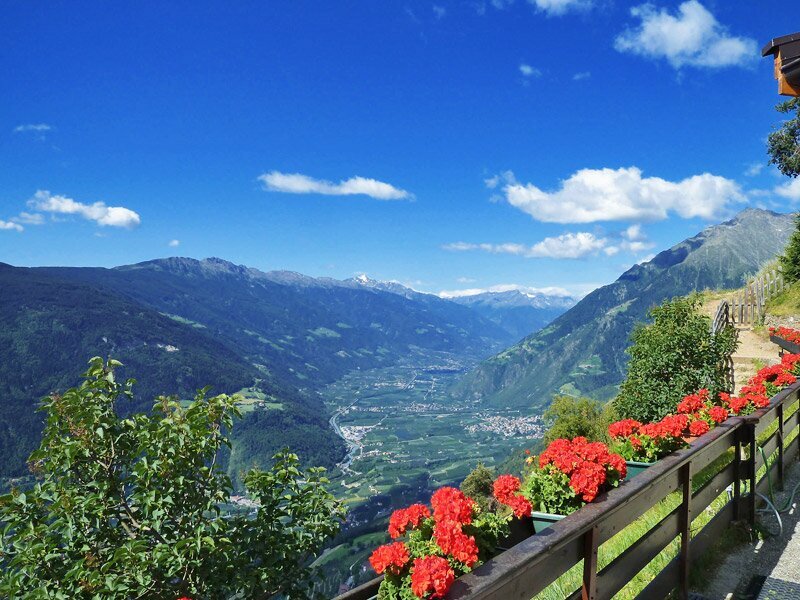 The municipality of Tirolo is located only 6 km from Merano, on a sun-drenched panorama terrace. 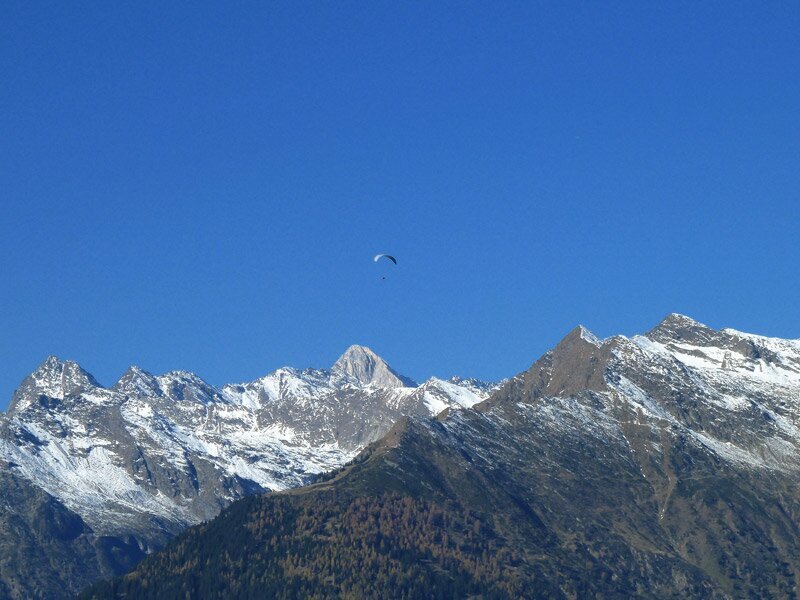 Live webcam View on Merano and Lagundo from 1,264 m asl. 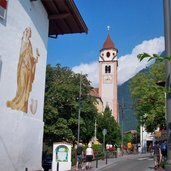 The village of Tirolo (or Dorf Tirol in German) is located on a sunny hill above the town of Merano. 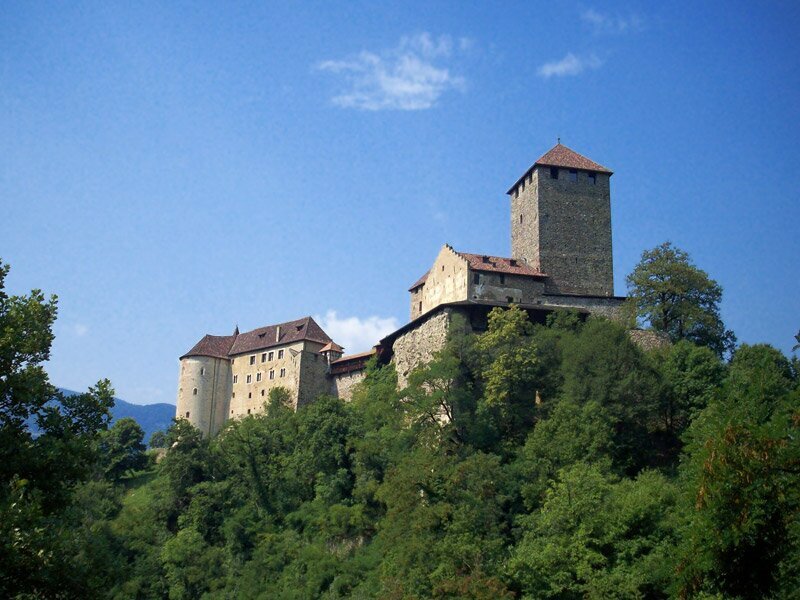 Castel Tirolo (Schloss Tirol) is the symbol and name giver of the region. 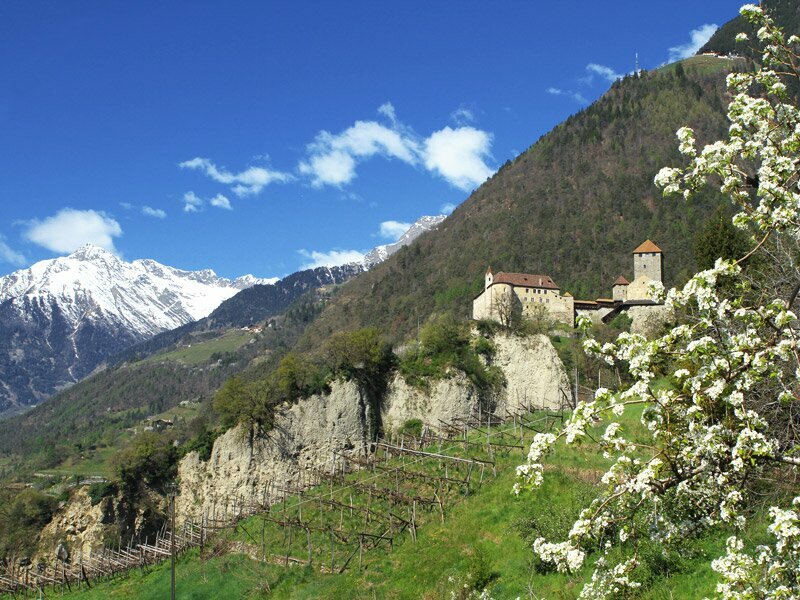 The landscape around Castel Tirolo in spring. 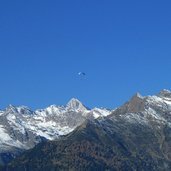 Mount Ivinga (Ifinger) summit is covered by the snow, but down in the valley the climate is mild. 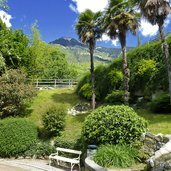 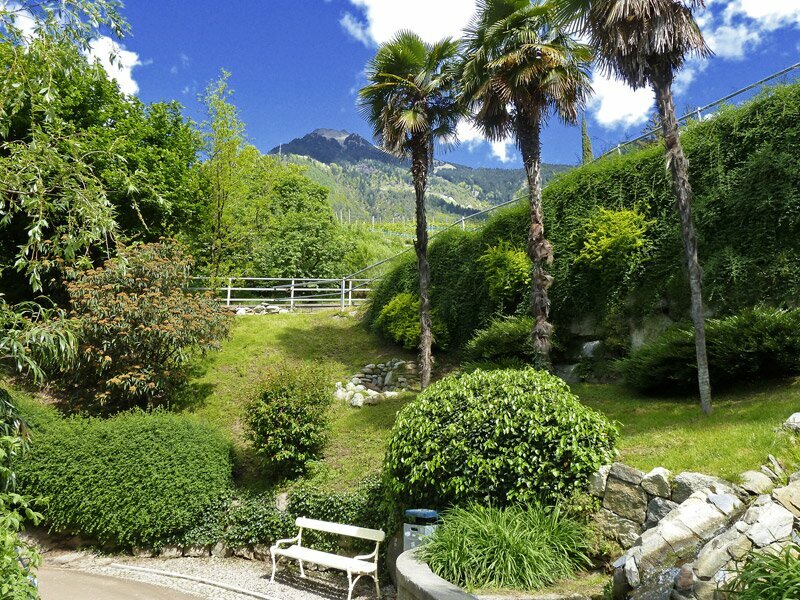 In spring, a nice place to stay is Tappeiner promenade, between Merano and Tirolo. 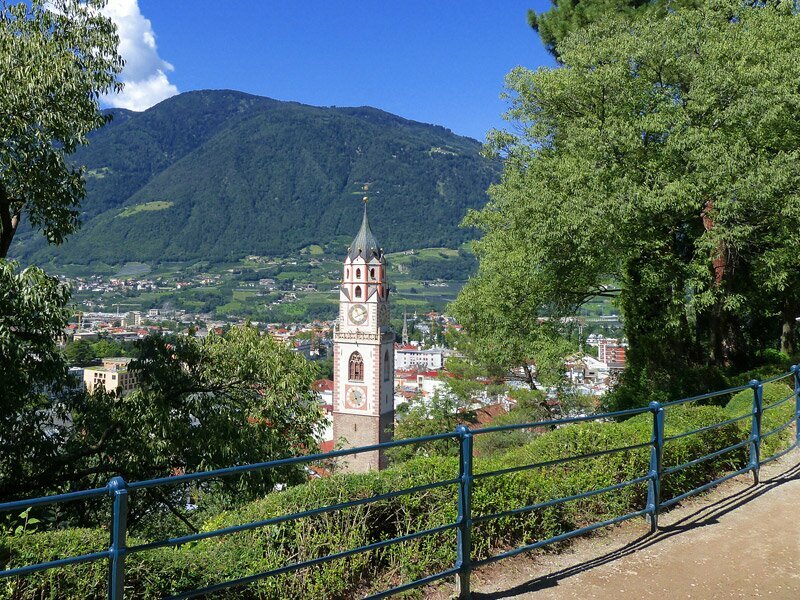 From the promenade, you can observate the centre of Merano. 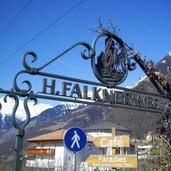 Parks along the Tappeiner promenade. 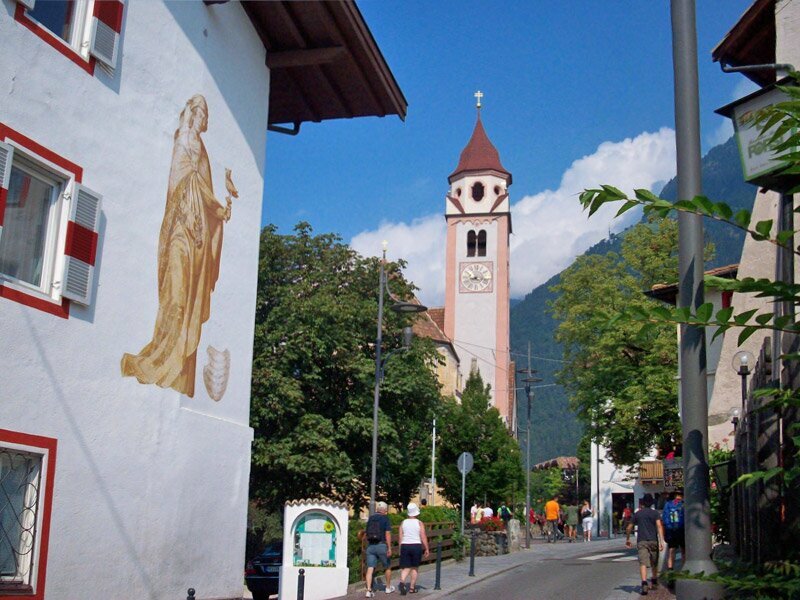 Tirolo’s village centre with the Saint John’s church. 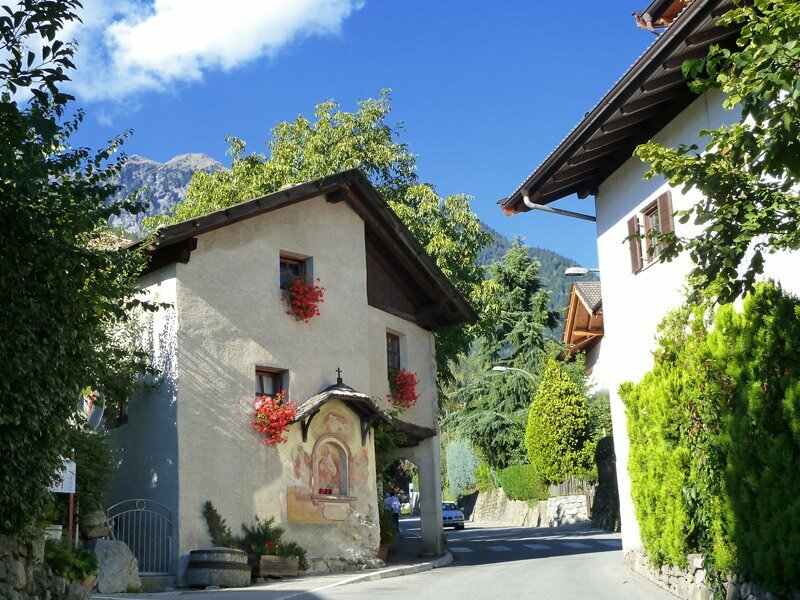 Old and new buildings at Tirolo village. 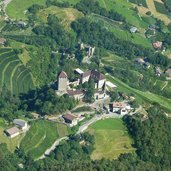 Brunnenburg, or Castel Fontana, is the seat of the agricultural museum. 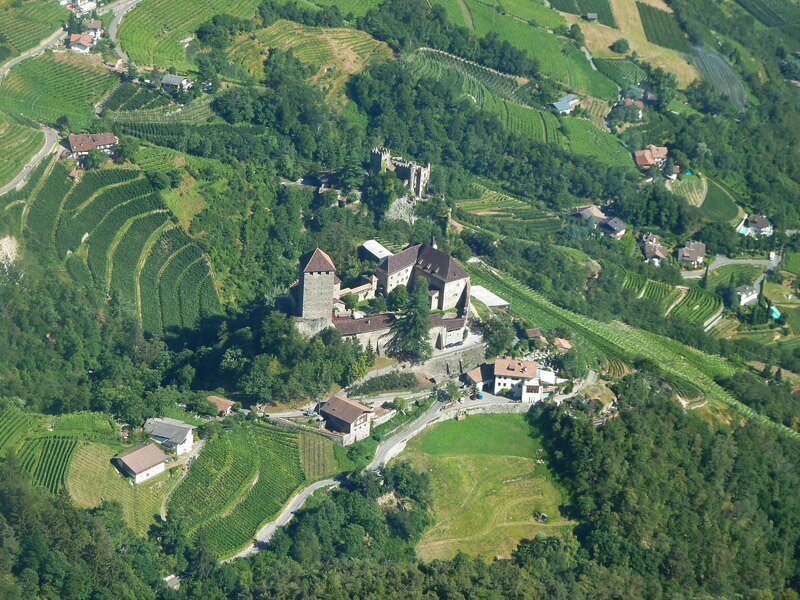 Castel Tirolo and Castel Fontana seen from the Hochmuth cable car. 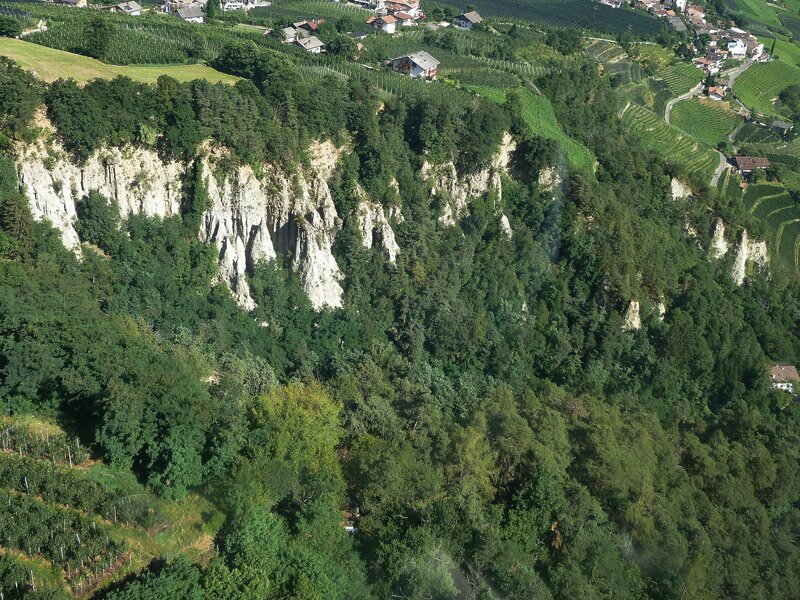 The earth pyramids of Tirolo are the result of the soil erosion. 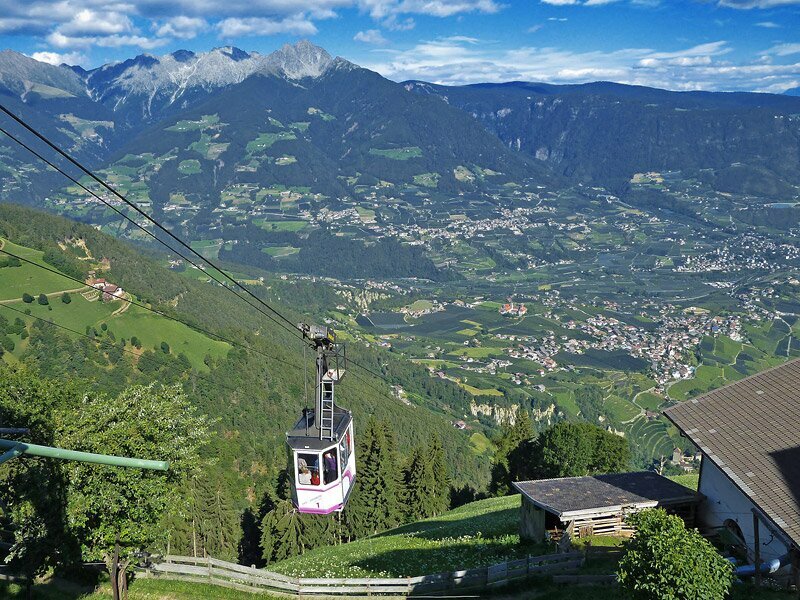 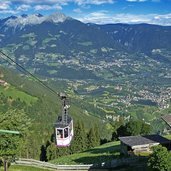 With the Hochmuth cable car from the mild landscape of Tirolo to the alpine mountain region of Tessa nature park. 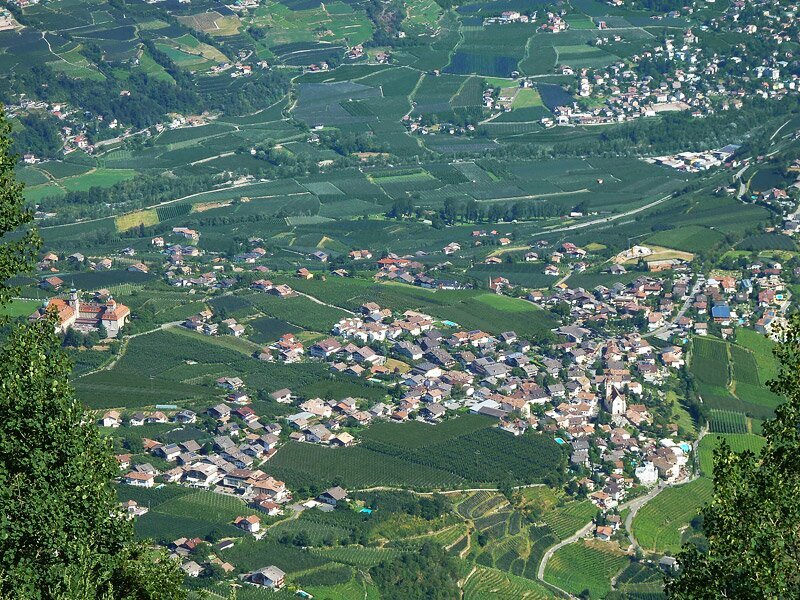 Sight from the Mut Farms to the Venosta valley. 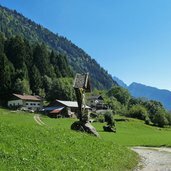 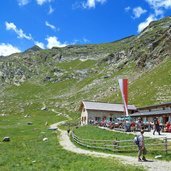 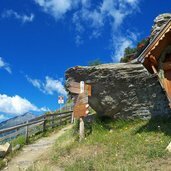 The Meraner Höhenweg trail (Alta via di Merano) is a 100 km long mountain path arount Tessa mountain group. 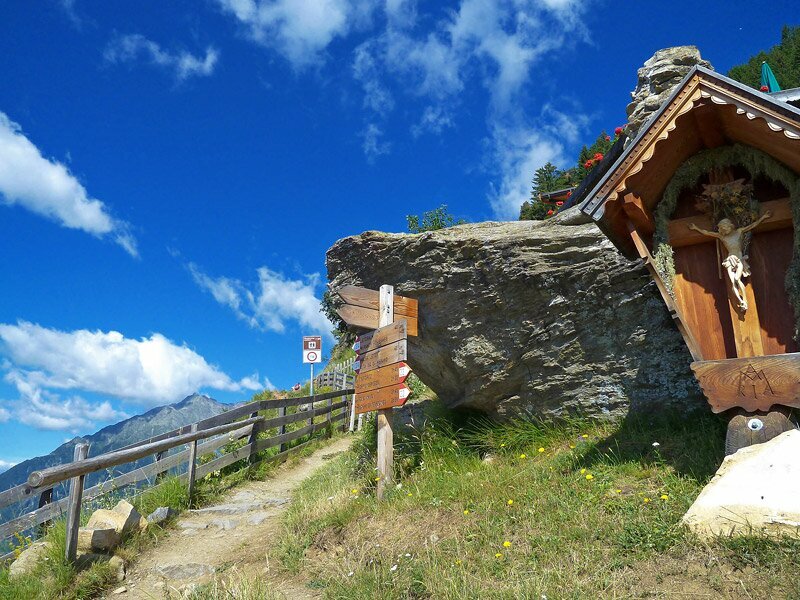 A segment of altavia meranese trail reaches Longfall hut, at the entrance to Sopranes valley. 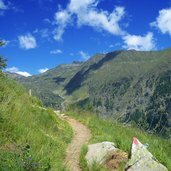 Hiking along the trail no. 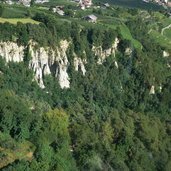 22 in Val Sopranes. 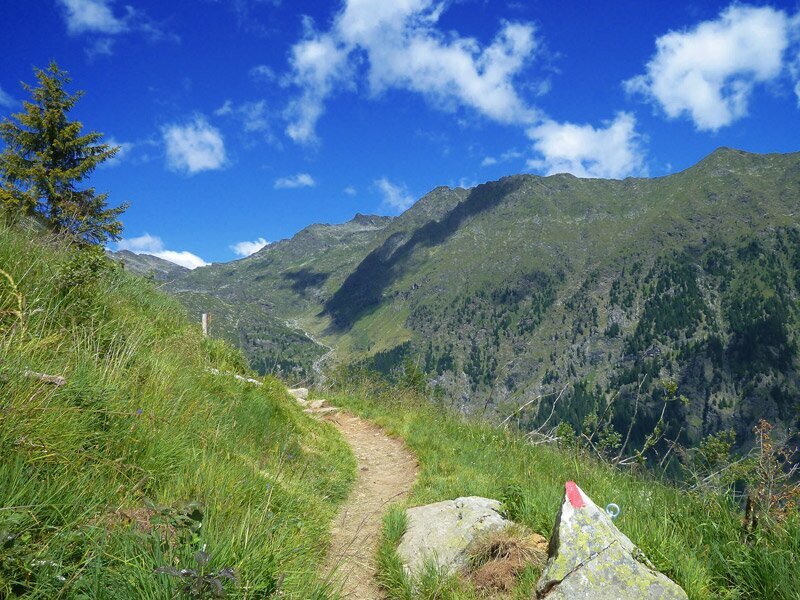 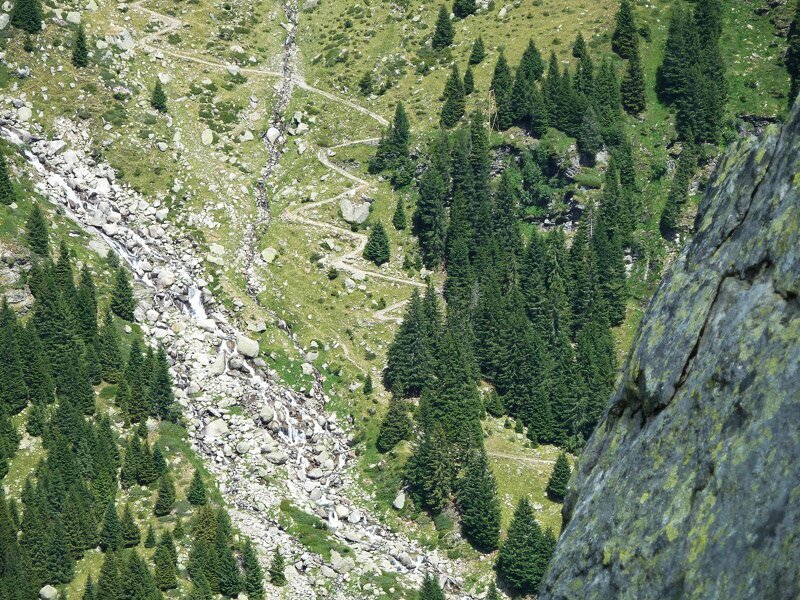 A steepish trail in Val Sopranes. 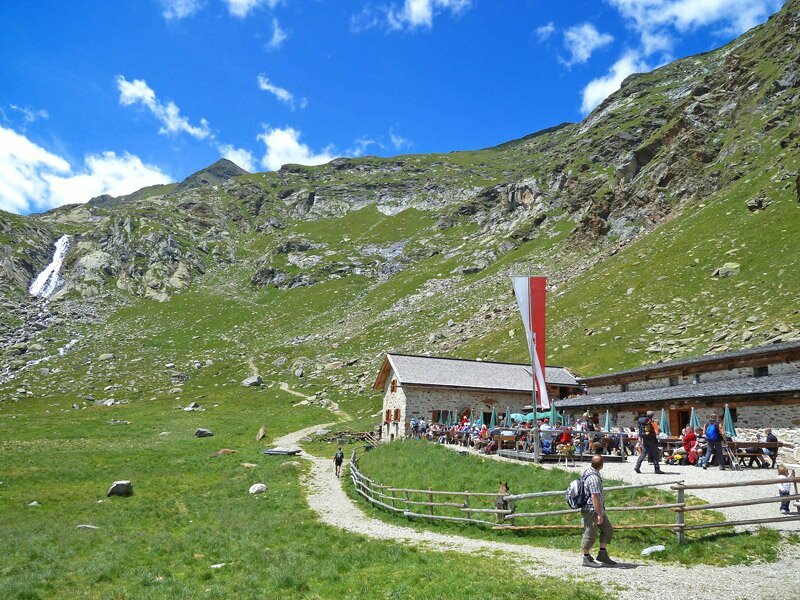 Oberkaser hut in Val Sopranes. 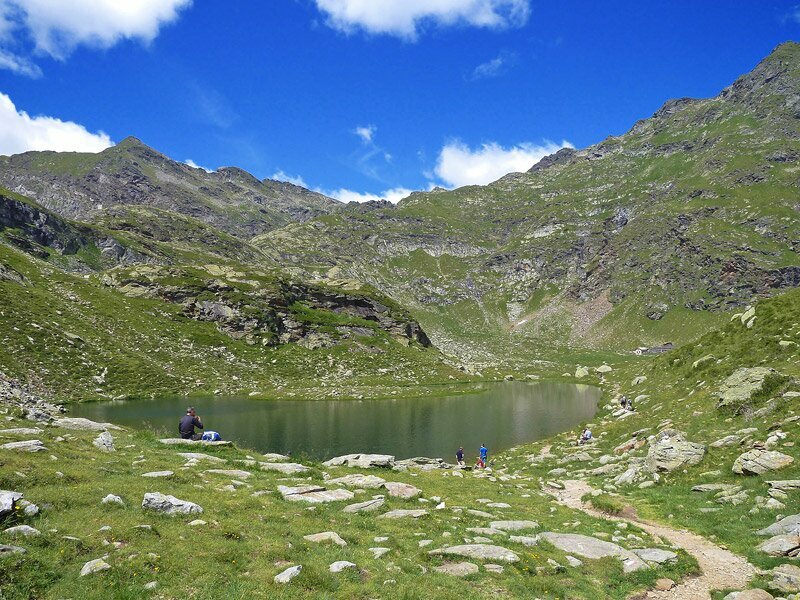 One of the smaller lakes of Sopranes is the Pfitscherlacke. 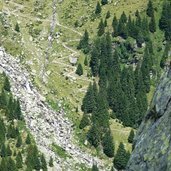 Sight to the other side of Val Passiria with the Alpi di Sarentino summits. 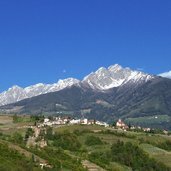 The first snow has fallen on the Tessa mountains. 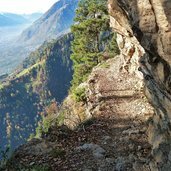 Late autumn is also a nice season for a vacation in the Merano area. 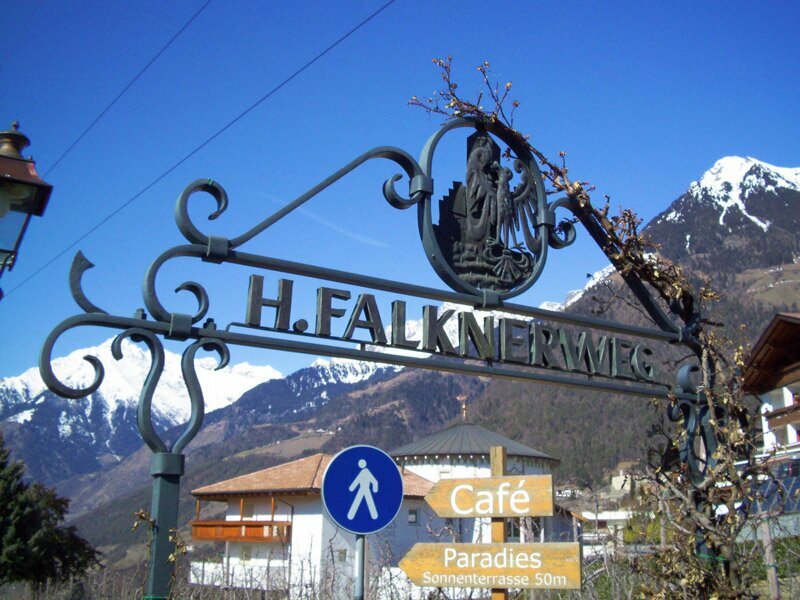 The Falkner promenade at Tirolo village. 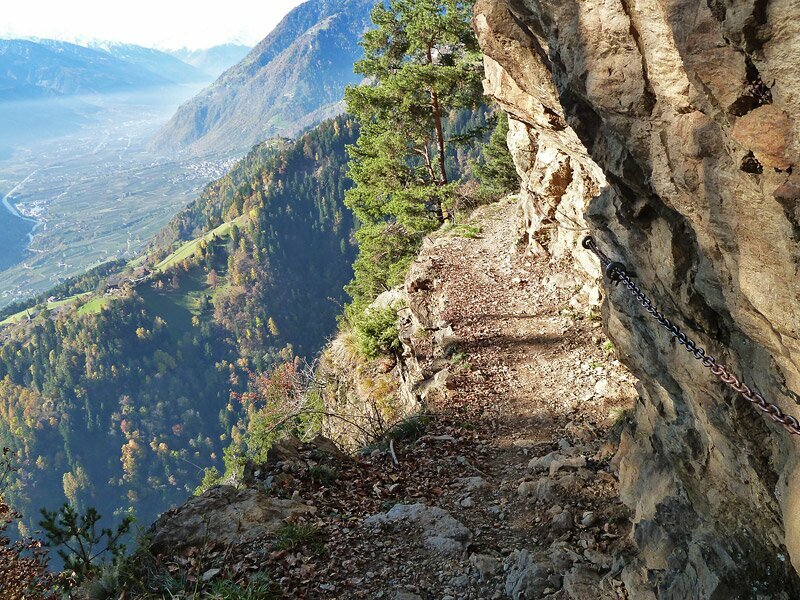 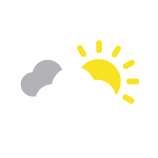 Due its sunny position, also during the cold season many people use it for a walk. 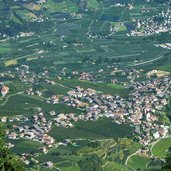 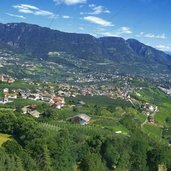 The Tirolo Wine Trail is a circular hike that promises wonderful views of the entire Burgraviato region as well as some interesting insights into the history of wine making. 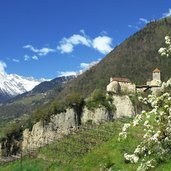 The comfortable hike through vineyards, apple orchards and chestnut trees can be done in an hour. 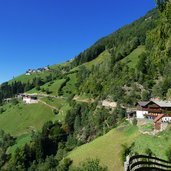 Autumn is one of the best times to go. 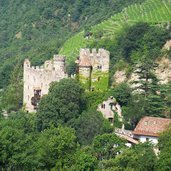 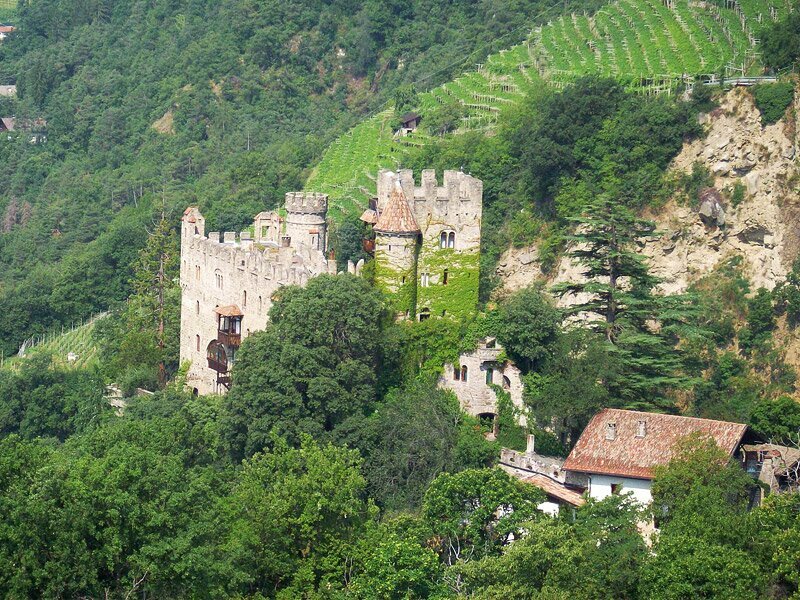 The most striking attraction of Tirolo is Castel Tirolo, enthroning a hill above the city of Merano. 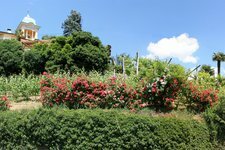 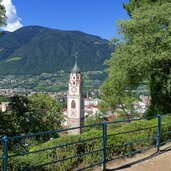 Due to its vicinity to the city, you can comfortably visit the Botanic Gardens of Trauttmansdorff Castle or the Thermal Baths of Merano. 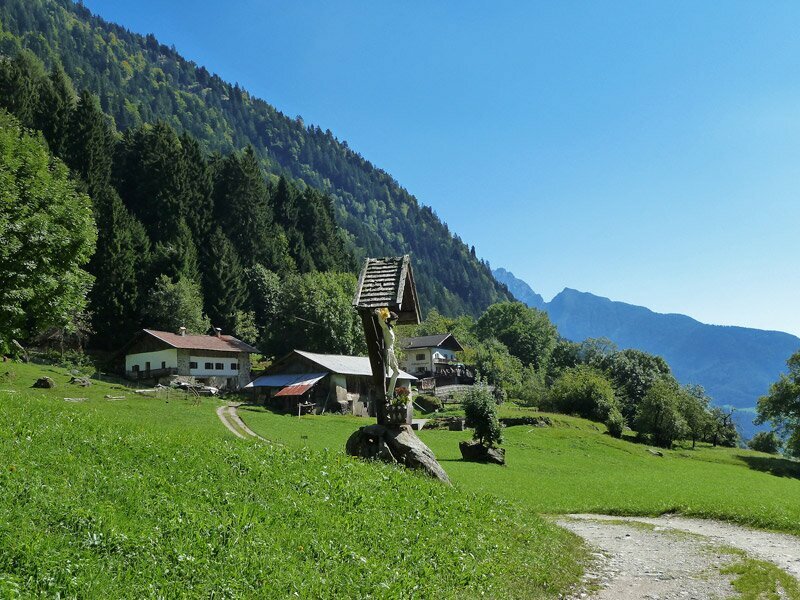 Moreover Tirolo is an ideal starting point for hikes in the heart of the Gruppo di Tessa mountain range. 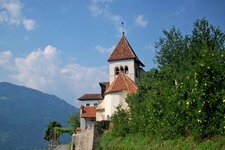 The municipality of Tirolo has got some 2,500 inhabitants and stretches from Monte San Zeno at 600 m asl up to the Gruppo di Tessa nature park and the lake plateau of the Sopranes lakes at 2,500 m asl. 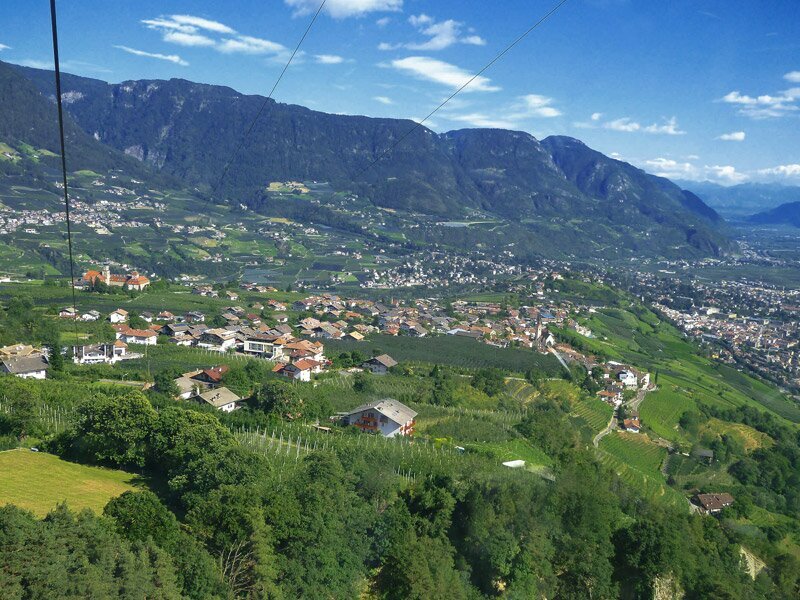 Due to the drop in altitude of the municipal territory, the area of Tirolo is rather varied and rich in contrasts. 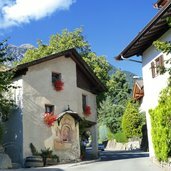 The village itself, however, is characterised by cypresses, palm trees and oleander, that is to say a merely Mediterranean alpine vegetation. 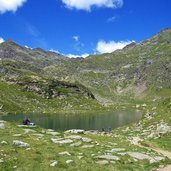 In higher altitudes, which are by the way ideal for hiking in summertime, alpine flowers and pine tree forests characterise the landscape, while the mountain peaks in the surroundings are often still snow-capped until summertime. 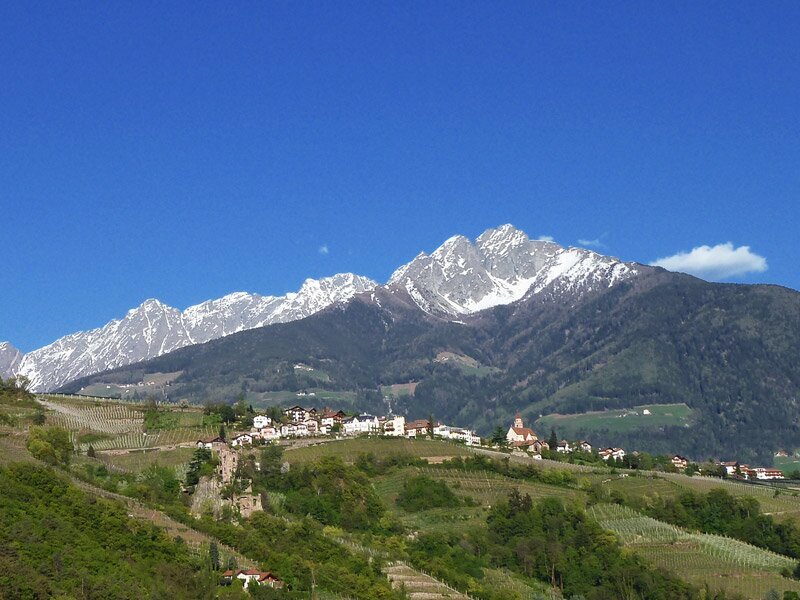 Close to the village, there is Castel Tirolo, which is a former seat of the counts of Tyrol and name-giving for Tyrol. 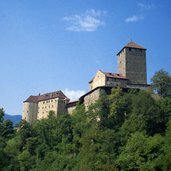 Today the castle hosts the Provincial Museum of Cultural and Provincial History. 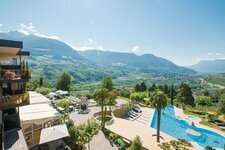 Worth a visit are also the Muthof farmsteads, snuggling on the slopes of the Dosso della Muta mountain and belonging to the most ancient farms of Merano and surroundings. 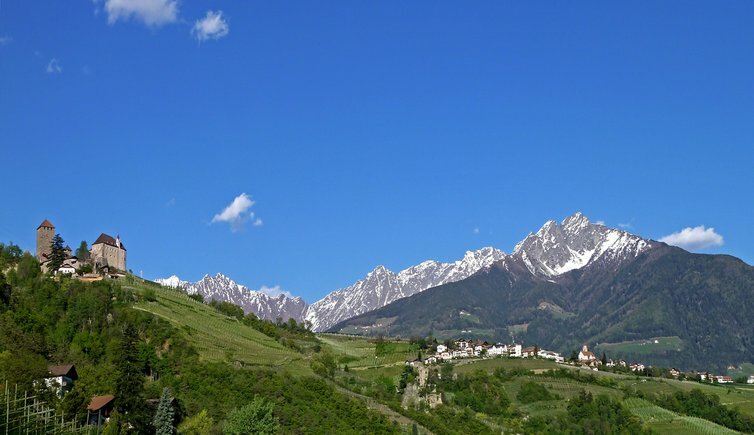 San Pietro is situated at the sunny slope of Merano and was once known as Kronsbichl.